Any day in the mountains is a good one, but some days stand out as better than others. This was one of those days… I’d been planning to climb something this weekend, but just wasn’t sure what that would be until Friday evening. 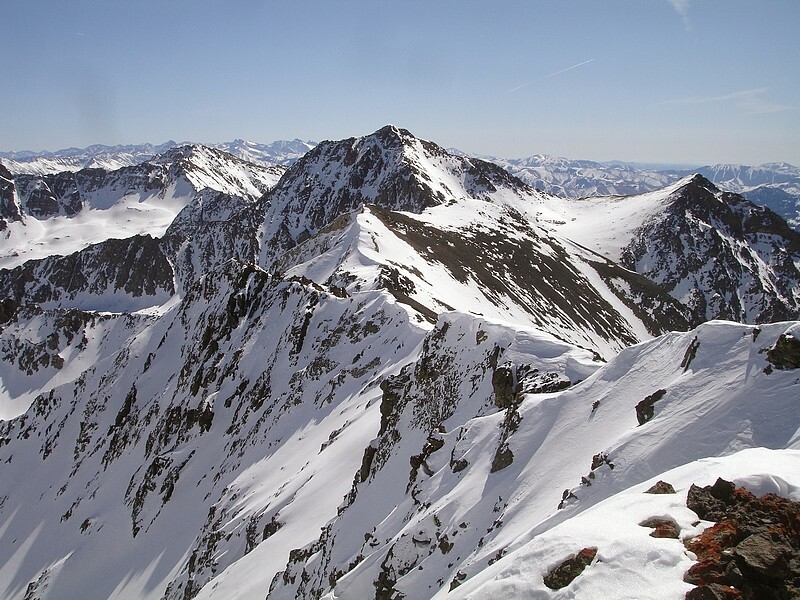 After bouncing ideas off of John R and John P (aka Splattski), we narrowed in on the Boulder Mountains, and Easley Peak, with a possible side trip over to Cerro Ciento if we had the energy. 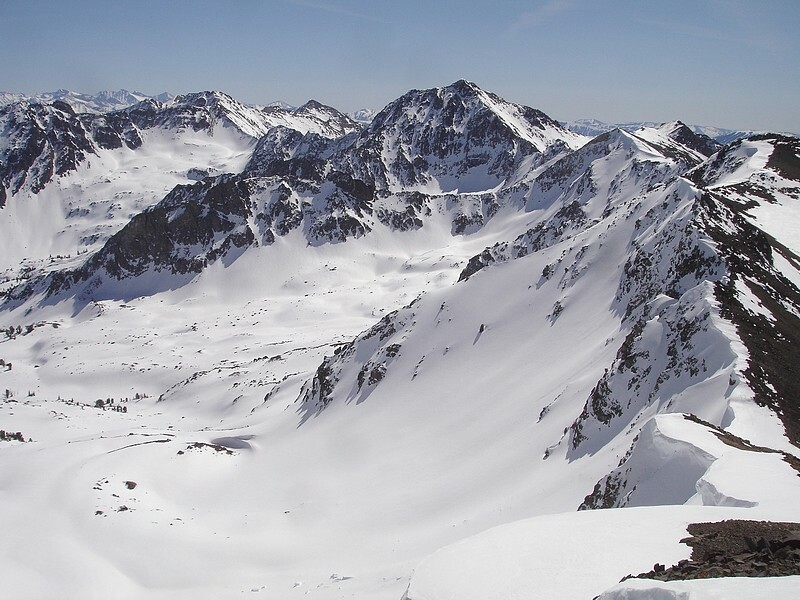 The Boulder Mountains are located northwest of Ketchum and are full of giant peaks. 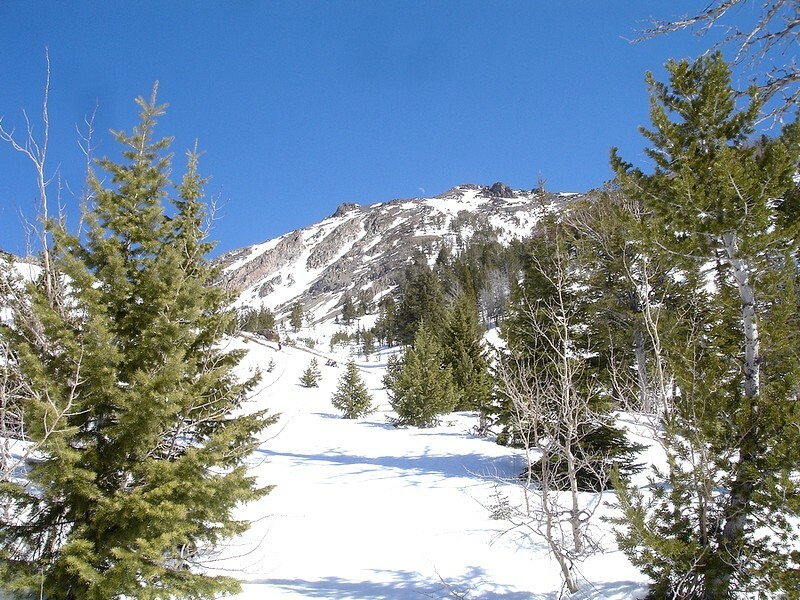 Highway 75 passes right by them, so they offer some of the best opportunities in Idaho to get above 11000’ while the ground is still covered in snow. And it turns out, you can even summit two big peaks if the conditions are good. I was up just after 3am, and picked up Splattski and his friend Dylan just after 4am. 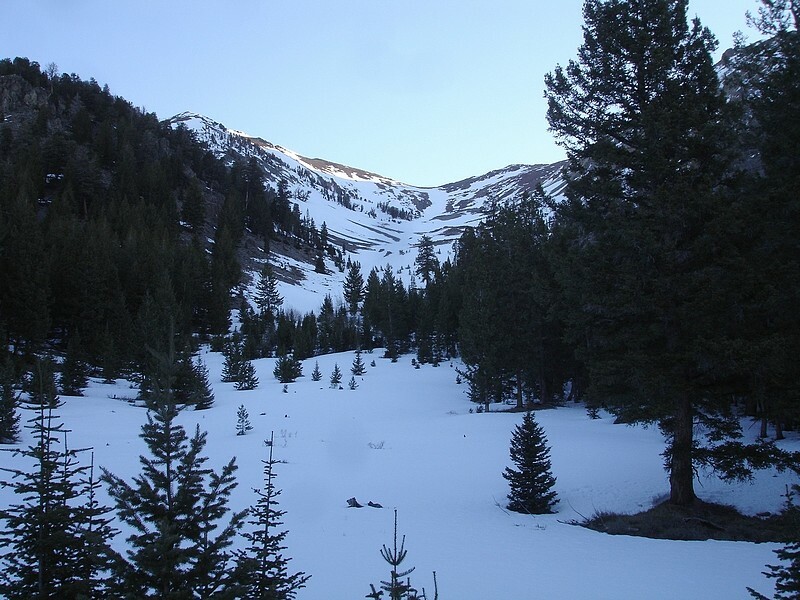 We met John in Mountain Home, then made the pre-dawn drive up to the Owl Creek trailhead. It was an earlier start than I usually like to make, but we needed to get up high then back to the car early before the snow softened too much in the unseasonable warm weather. We started hiking around 7:30 and had to put on the snowshoes within a few hundred yards after leaving the highway since the crust wasn’t strong enough to hold us. It was a crisp 20-degree morning with the sun just beginning to touch the top of Saviers Peak and the rest of the Smoky Mountains at our back. 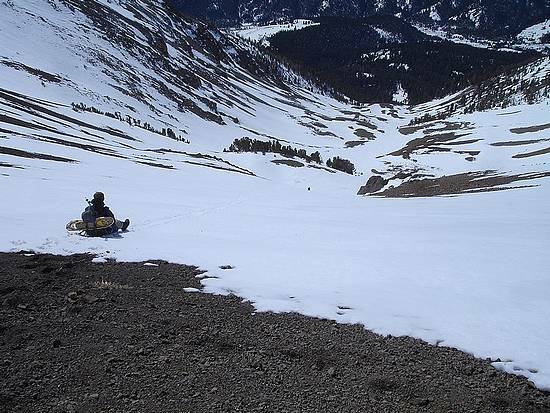 We were making good time and could see that the south ridge of Easley Peak was snow free, but Splattski had a better idea. 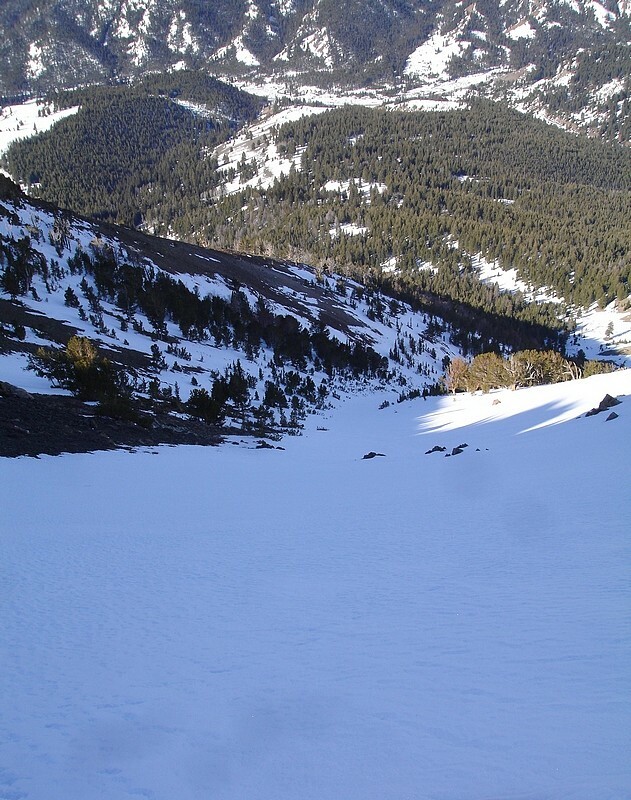 He suggested we head up the valley between Easley and Cerro Ciento, and look for a snow climb on Easley’s west face. This plan worked out great. 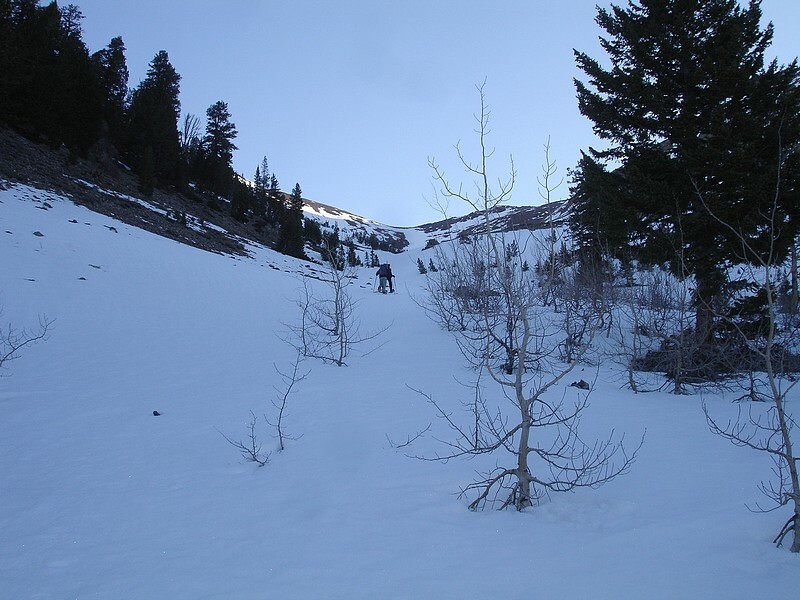 After a couple miles of snoeshoeing, we reached a good-looking gully that began at around 9000’. Here we strapped on the crampons and began climbing the gully. It averaged around 35 degrees slope, nearing 45 degrees towards the top. The route gave us close to 2000 vertical feet of gain, and was a major calf and lung workout (for me at least). From the top of the gully, it was just a gradual walk to the summit. The views from the top of Easley were fantastic. All of the snow-covered peaks in the surrounding ranges were soaking in the sunshine. The weather was great and we were all feeling pretty good, so we decided to head over to Cerro Ciento. Dylan and Splattski had been waiting for us a little while, so they went ahead to scout out the route while John and I had a snack. Soon we were on our way. It was a fairly easy ridge-walk between the two peaks, and only around 400 feet of loss/gain along the way. The views from the top of Cerro Ciento were excellent as well. Splattski even had some binoculars to check out the Sawtooths to the west. 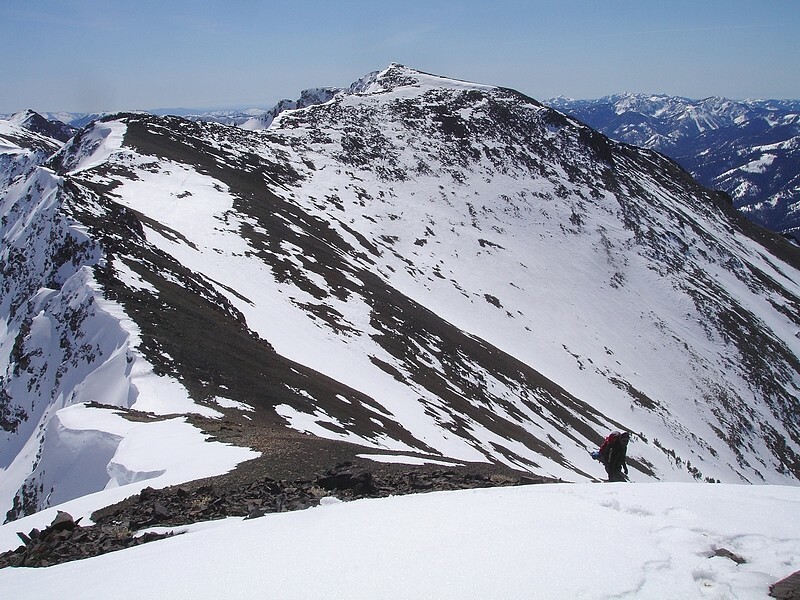 It was just after 1pm when we left Cerro Ciento and headed back to the saddle between the two peaks. This is where we would begin our glissade descent. We’d eyed the route while climbing Easley (not easily), and knew that there were minimal obstacles. The only question would be the snow conditions. Turns out the snow was perfect. The end result was nearly 2500 vertical feet of descent with only a couple short strolls mixed in. It was a blast! All of us had fun, but I had it the best in terms of speed and distance. The others claimed that my $5 jogging pants gave me the advantage, but I’m pretty sure my superior technique made all the difference (wink). 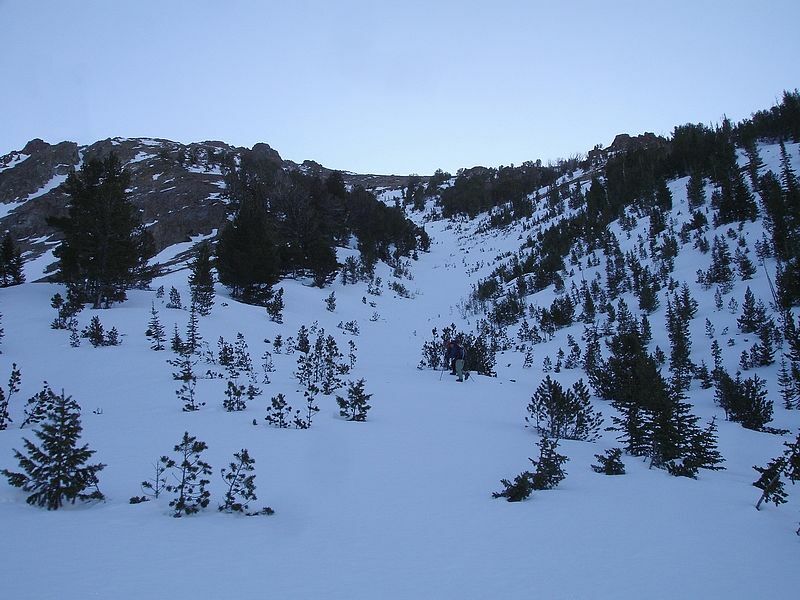 After the glissade, we put the snowshoes back on, and layered down to t-shirts for the hike out. The temperature had risen into the upper 50’s or so, which was nice and comfortable, but it also resulted in some post-holing as we weaved our way through the trees. We made it back to the car by around 3pm and our early start had paid off. If we’d been out on the trail much later, it would probably been a total slush fest. It was my first time in the Boulders, and I couldn’t have asked for a better day. 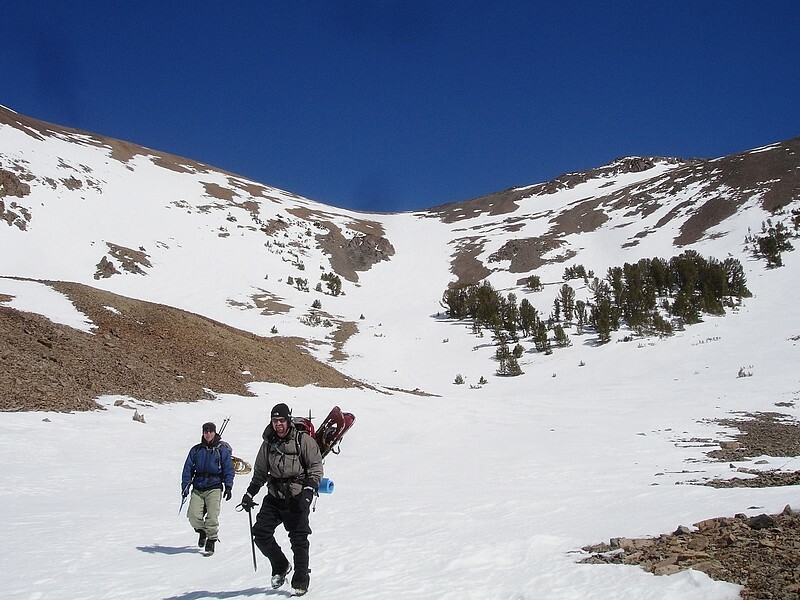 Perfect weather, a variety of terrain, two 11000’ peaks, and fun cohorts. 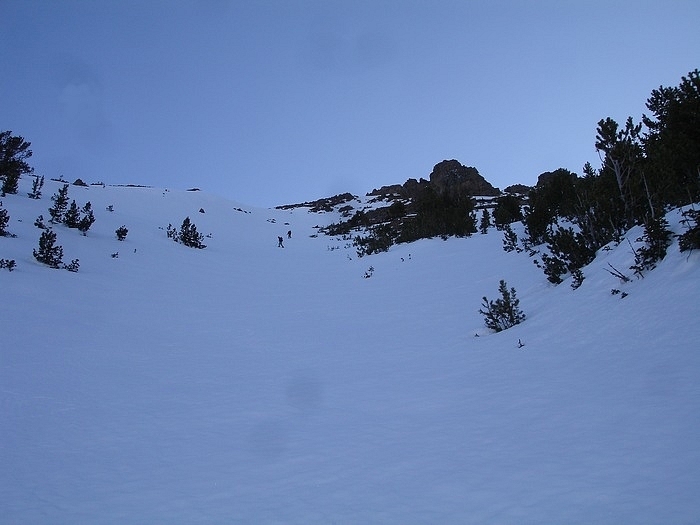 Looking up to the saddle between Easley Peak and Cerro Ciento. Dylan and John climbing up the draw. The sun soaked Smoky Mountains behind us on the way up. John and Dylan starting up the gully. The gully opens up a bit as it nears the ridgeline. John and Dylan are nearing the top. This is the view down from the top of the gully. 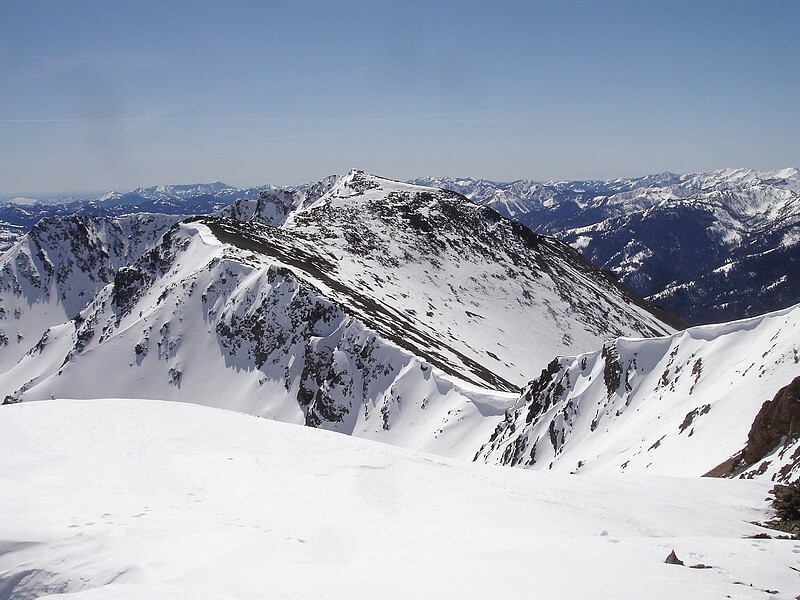 Cerro Ciento as seen from around 10700' on Easley Peak. Here's the impressive Lorenzo Peak to the east of Easley Peak. 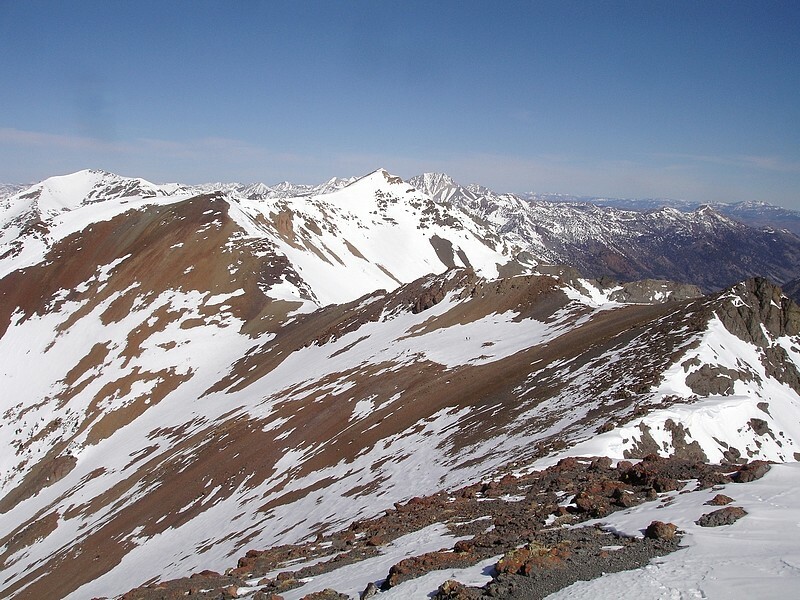 The view to Cerro Ciento west of Easley Peak, with the White Clouds in the background. John nearing Cerro Ciento's false summit, with Easley Peak behind him. 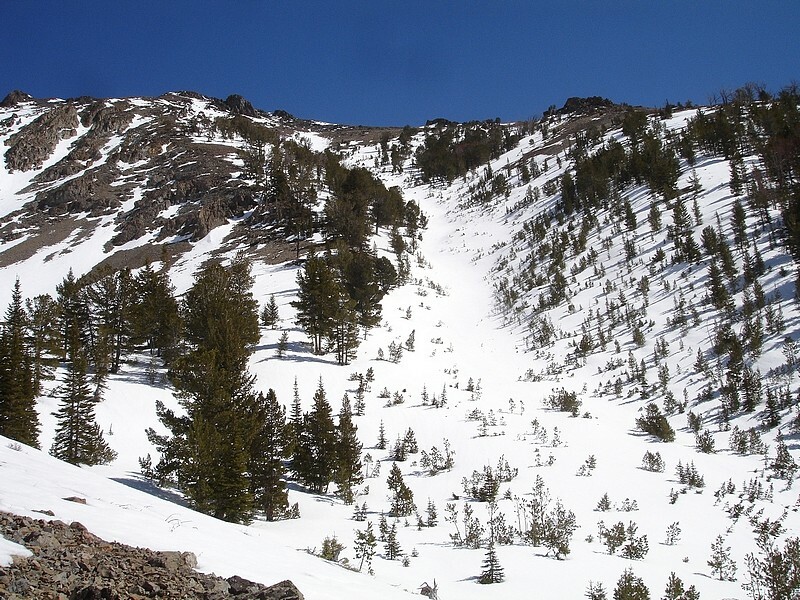 The north side of the Boulder front, still buried in snow. Lorenzo Peak is just right of center. 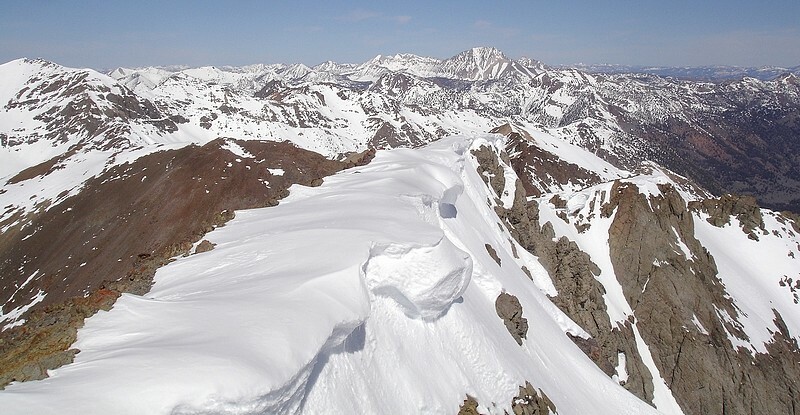 A view of the White Clouds and Castle Peak from the summit of Cerro Ciento. 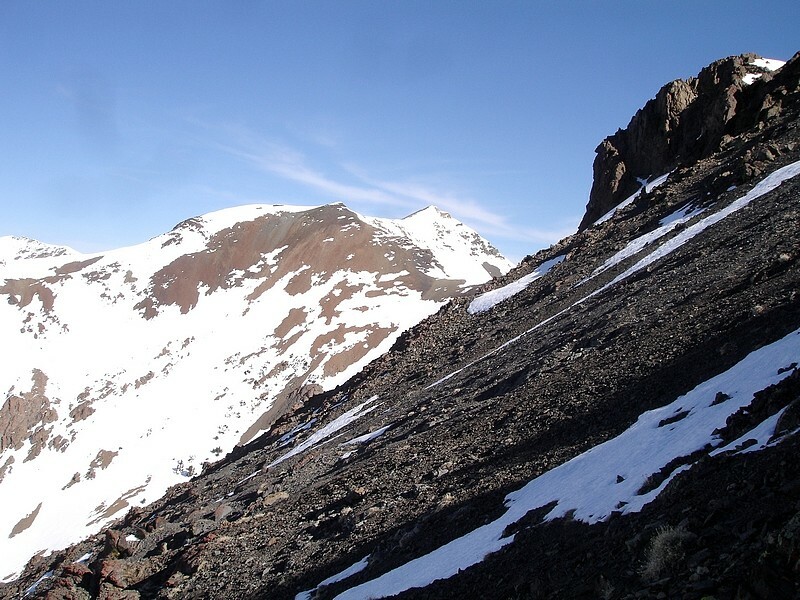 Easley Peak from Cerro Ciento. 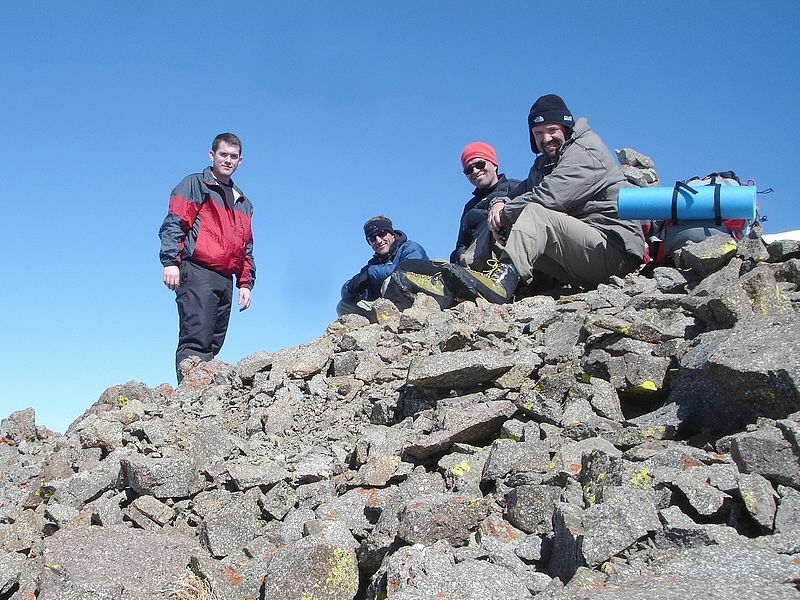 Dave, Dylan, John P, and John R on the summit of Cerro Ciento. Here's Dylan beginning his glissade, with John already a few hundred feet below. Here are the other three guys coming down the second glissade section. Dylan and John on the way down, our glissade route in the background. This is the gully on Easley Peak's west face that we climbed during the ascent. Looking back on Easley Peak with the moon directly behind. The other guys are just visible through the trees, at the end of their glissade.